Last week brought a small pile of books. 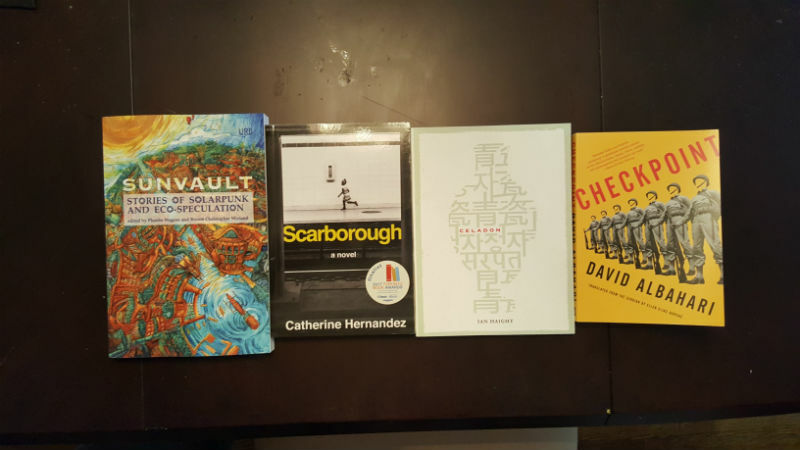 On the left is Sunvault: Stories of Solarpunk and Eco-Speculation, which I picked up as research material for an upcoming anthology submission. The second, Scarborough, was recommended to me by my girlfriend, and on quick glance looks like it will be a fantastic, emotional read. Celadon is collection of poetry by my friend (and 3288 Review contributor!) Ian Haight. Checkpoint is the most recent arrival through my subscription to Restless Books. Bonus note: all four of these are published by indie publishing houses! One day I will be retired or otherwise unemployed, and on that day my pile of unread books will start to shrink. Or more likely, continue to grow at a slower pace.